A wildly irreverent satire of gender identity and family dynamics, Rodi's 1995 novel has been long out-of-print; now it returns, its NSFW hilarity as timely as ever - if not timelier. Mitchell Sayer, a buttoned-down gay attorney at a prestigious Chicago law firm, discovers he has a long-lost twin. But his well-ordered life comes apart at the seams when the separated siblings finally meet, and Mitchell discovers his brother Donald is better known as Kitten Kaboodle, star of the city's most infamous drag revue. Plunged into a chaotic world where he's forced to confront his own fluid masculinity, Mitchell learns that appearances aren't just deceiving - they're even more disturbingly revealing. Building to a riotous climax in which identities blur and destinies go bust, all to the accompaniment of a cabaret pianist, Drag Queen is a rip-snorting romp through wigs and wardrobes, wit and wantonness. I remember reading Drag Queen sometime in the early 00s, freshly out of the closet; it was a cute little satire that vaguely resembled real life at the time. Re-reading it as a queer adult, one who is now comfortable in who and what he is, I found this both a refreshing reminder of the fun of my early gay days and a more sobering reminder of the inherent danger we all felt back then. Not that there isn't some level of inherent danger today, especially given the current political climate in the country, but I do like to think we've come some way since Drag Queen was originally published, and I generally don't think twice about holding my boyfriend's hand out in public. 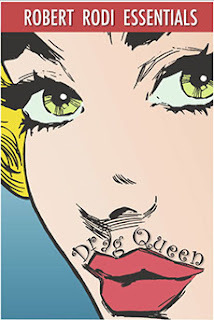 Drag Queen is a comedy of errors as Mitchell Sayer, an attorney at an established law firm, discovers he has a long lost twin brother. However, Donald is everything that Mitchell is not: he's flamboyant, in-your-face, and a drag queen. As each brother tries to reconcile their feelings about the other, circumstances bring them to an unexpected finale that challenges each brother's very core and brings them ever closer together. Rodi captures each brother's personalities perfectly; Mitchell is so scared of being too gay, Donald is terrified of being normal. These may be read more as stereotypes now, but there is some definite truth in what each brother is feeling - and this is where Rodi shines as a writer. He gives an honest voice to the fears that many gay men, then and now, feel about who and what they are, and while he covers everything in the laughable shine of satire so that it doesn't seem so terribly bad, these are truths we have all at one time or another faced or are currently facing now. The fear of being found out, the fear of being harassed both physically and emotionally; these are all things that have been at the root of so many men not coming to terms with who they are or letting their friends or family get too close. After I re-read Drag Queen, I discovered that Rodi wrote several novels chronicling the trials and tribulations of being gay in the 90s and I'm going to go back and start at the beginning of these stories and read my way thru them, both for a chuckle but also as a reminder of how far we've come and how far we still have to go.